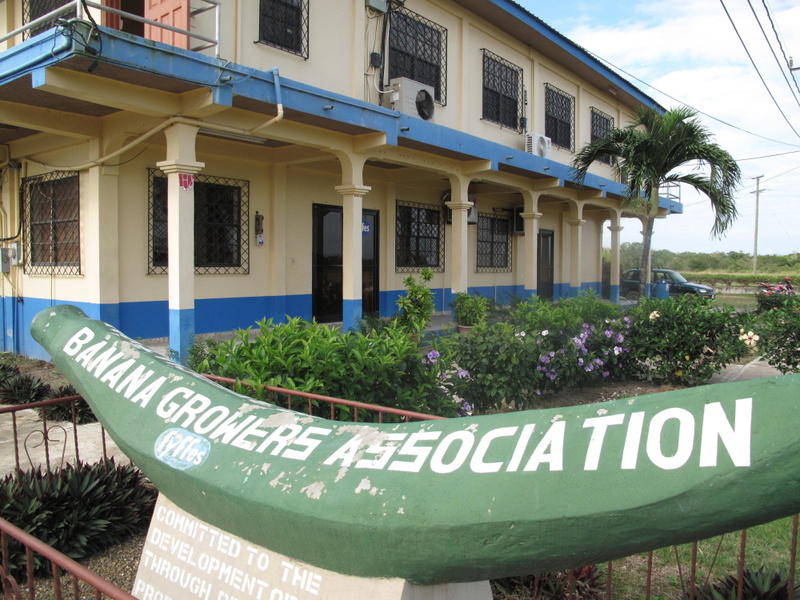 My home island of Ambergris Caye isn’t known for agriculture. Years ago, there were coconut plantations but now tourism is a way of life in San Pedro. On much of mainland Belize though, that is not the case. 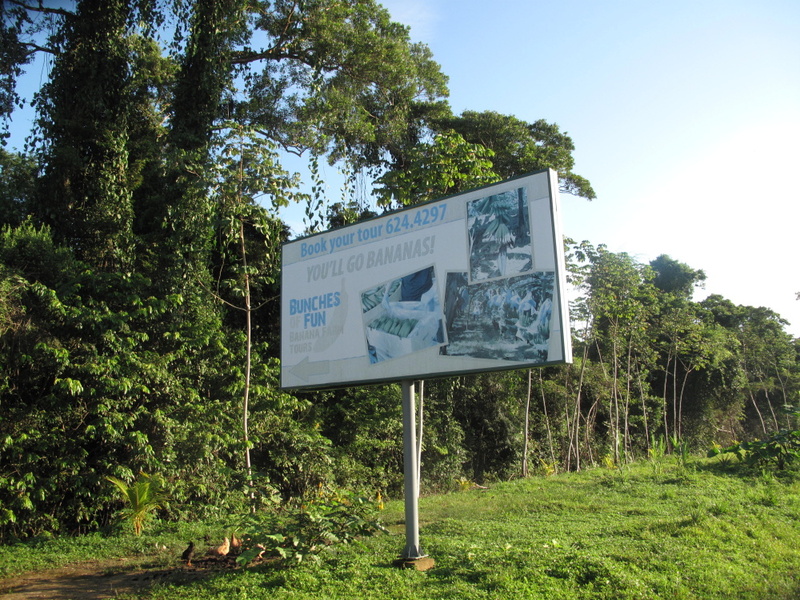 Head up north and you will see papaya and sugar cane fields, to west, you’ll pass miles of cattle and farmland and when you head over the Maya Mountains towards Dangriga, the hills roll with citrus trees. I had also taken this picture a few days before in the port town of Mango Creek. The port that carries all of the bananas and much of the oil out of Belize. 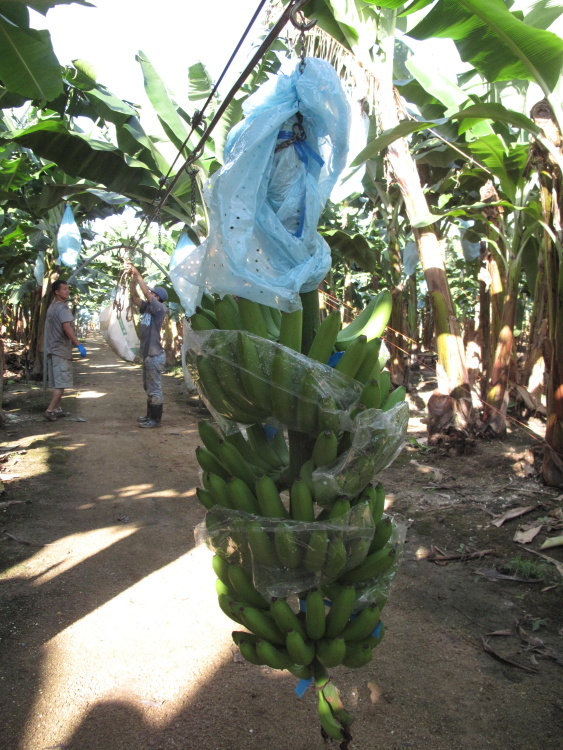 I jumped on the Placencia bus for the 35 minute bus ride to Riversdale and to the gate of the Sagitun Banana Farm. Evin, my guide, picked me up and drove me through acres of orange groves, a housing area, a beautiful football field and then bananas, bananas, bananas. Evin is from Oklahoma. She came down here a few years ago while working on her master’s degree in International Agriculture for a short internship and ended up marrying the plantation owner’s son. Is that not fodder for a Harlequin Romance novel of the Year? Evin Goss is now Evin Zabaneh and lives in Belize with her husband. She set up this tour from scratch and has done an amazing amazing job. It is so thorough and interesting…you see every single step from sprout to shipping, it is surprisingly fascinating. Kids would love it too. Pictures with your kids with machetes? GOOD TIMES. You watch a short video about the history of bananas in Belize (narrated by Erin over the theme song: DAY-O). You will be singing that song for the next few days. AT LEAST. Work all night and I drink a RUM! 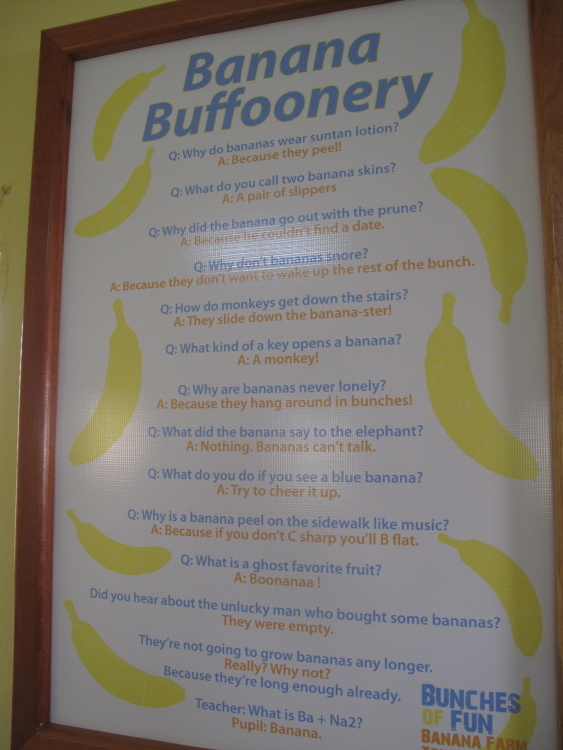 The room is papered with fun facts, silly banana jokes and all sorts of information. If ANYONE thinks they can beat me at a Banana Trivia Contest, they are SO wrong. Ideal temperature to store bananas? BING. 58 degrees Fahrenheit. 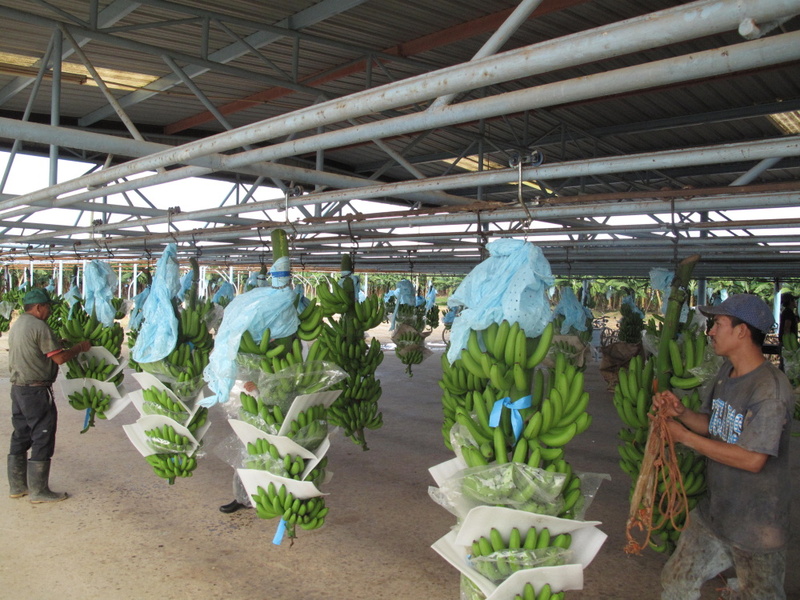 How many banana farms are there in Belize? BING. 24 with 9 owners. 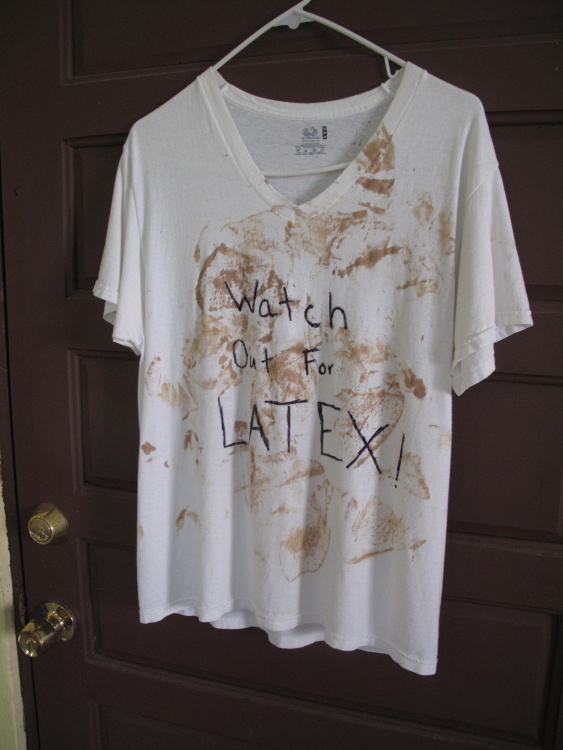 I was warned to watch out for the latex…the sap that drips from the banana plant. It’s a permanent stain to anything it touches. We head out to the field…a beautiful manicured path was waiting. And I was worried about wearing flip flops. 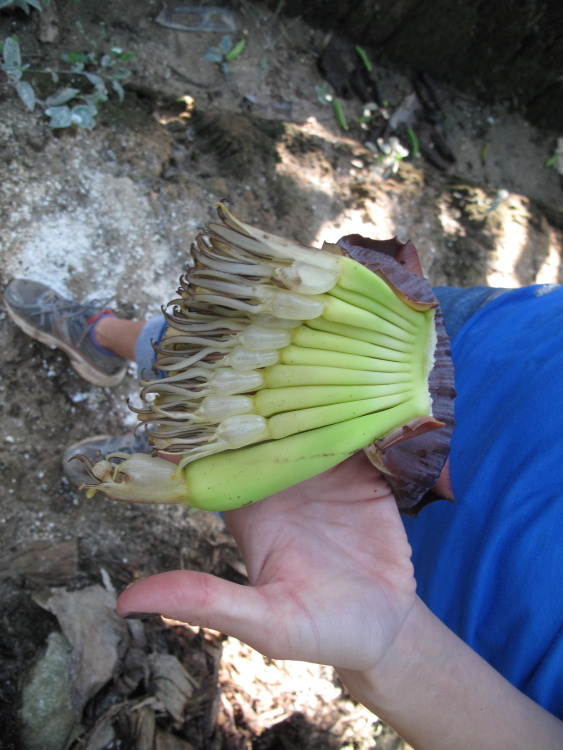 The banana plants (NOT TREES) are huge and really, really pretty. This arch ways hold the zip line that you’ll see in a bit. 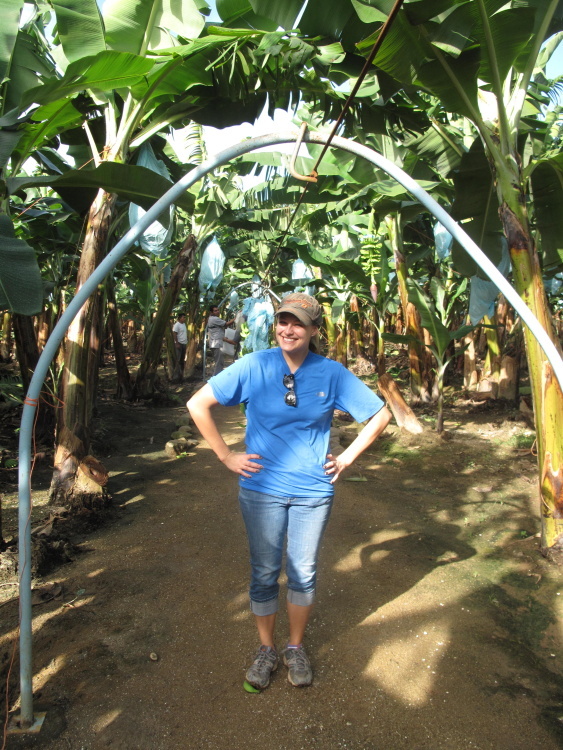 Since Tony and Evin married in the states, I tried to plan a banana field wedding under these arches. Wouldn’t it be beautiful? 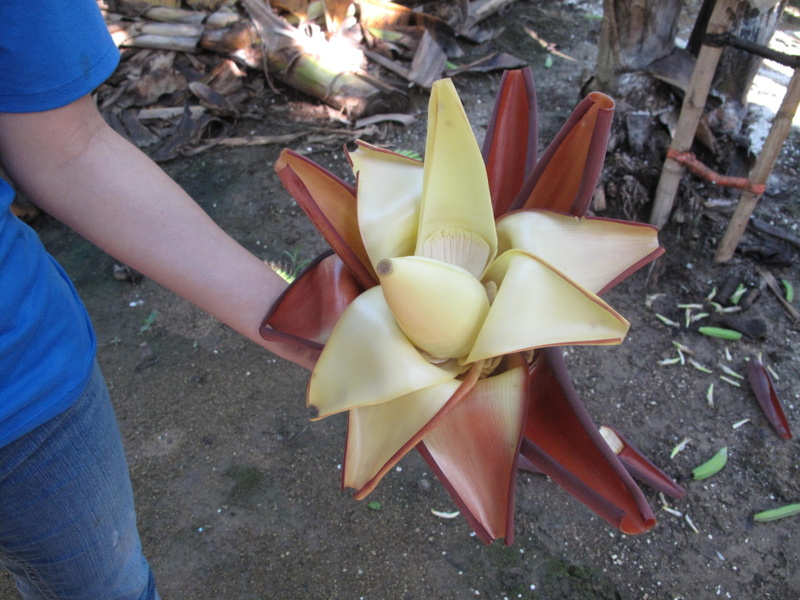 All the attendants carrying banana flowers? The plant is interesting in so many ways. 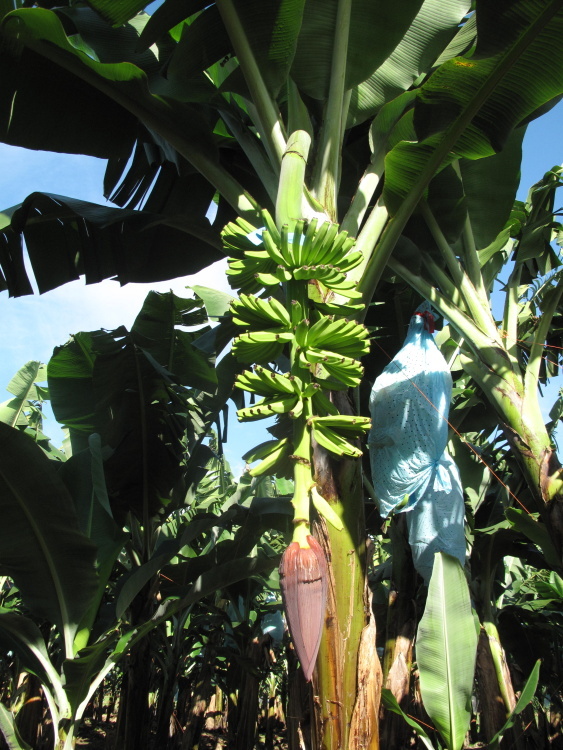 First, it is so rich in potassium that it basically makes its own fertilizer. 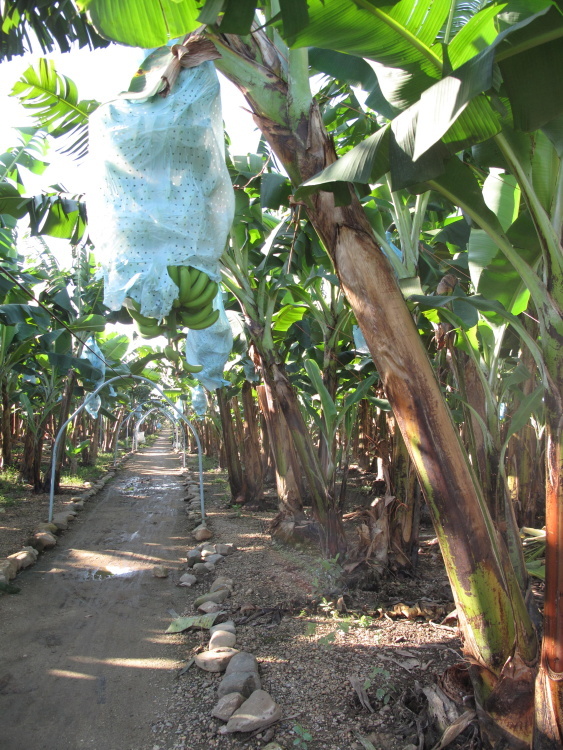 The baby bananas and flowers trimmed are made into mulch that is being spread around the base. SMILE! 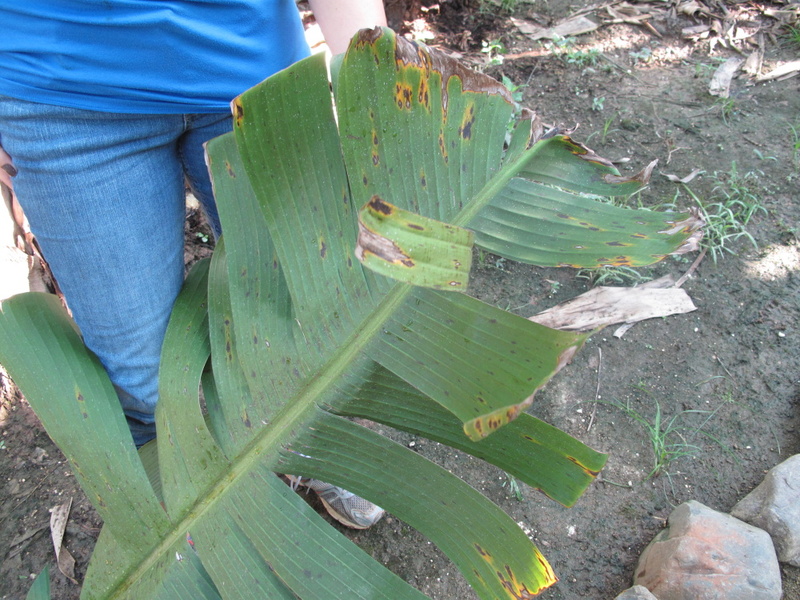 These plants (and all in Belize) are sprayed from the air for a fungus that can kill the plants. Keeping the fungus at bay is manual labor too. This gentleman showed me how he trims the leaves with this long stick and knife. The flower, the beginning of the fruit, peeping out of a plant. 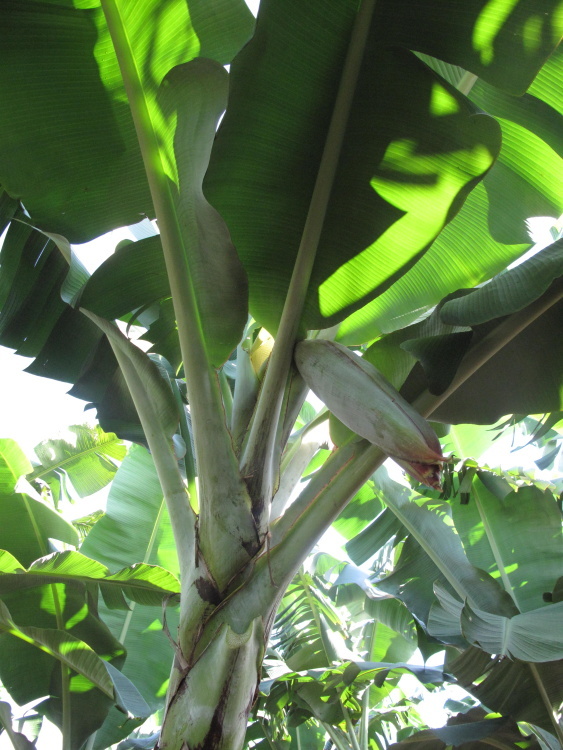 Banana plants grow insanely quickly…from little sprout to Jolly Green giant with up to 80lbs of bananas in 9 months. Each full grown plant produces one bunch and then is chopped down and it’s daughter plant grows. You can see three generations here. That process goes on indefinitely. 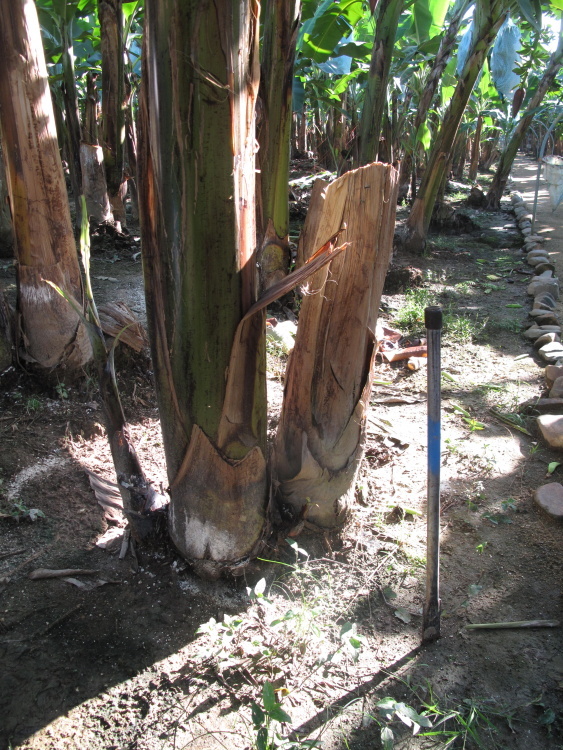 Mother plant gives bananas…chop her down for the next generation to grow. 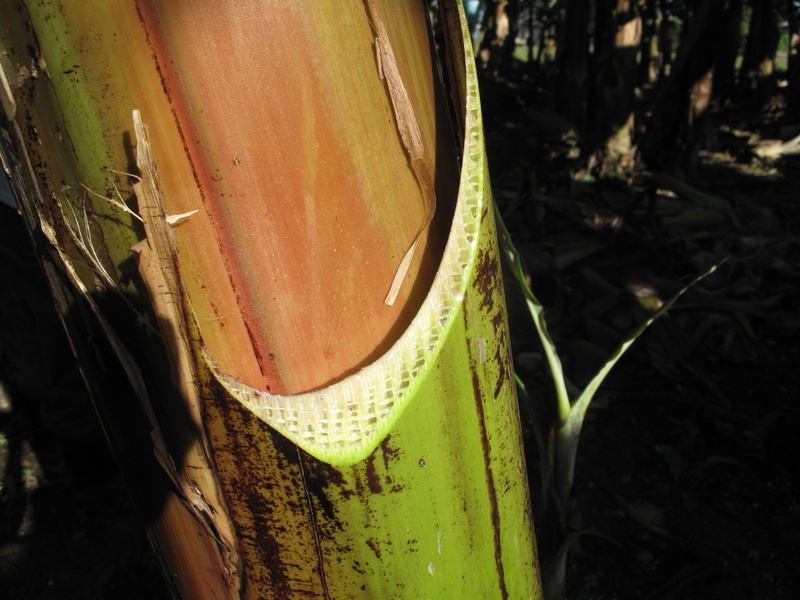 The plant is basically water…but has a special structure to keep it strong. Apparently cardboard boxes were designed after banana plants. Banana Jeopardy…I await your call! 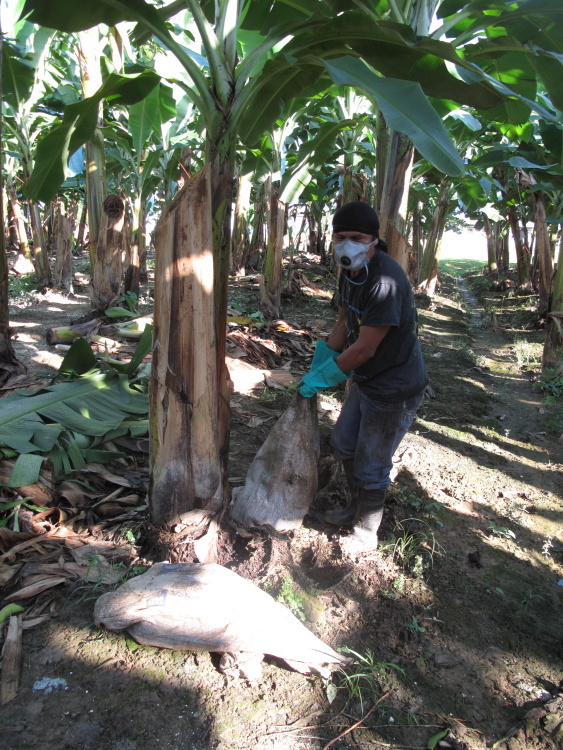 This guy trims the banana flower and the baby bananas that will never make it to full saleable size. Apparently he did NOT heed the banana latex warning. Sorry guys, you’ll never have a chance to become bananas. You’ll just never be good enough. He also puts the diapers and the bags on the banana hands. 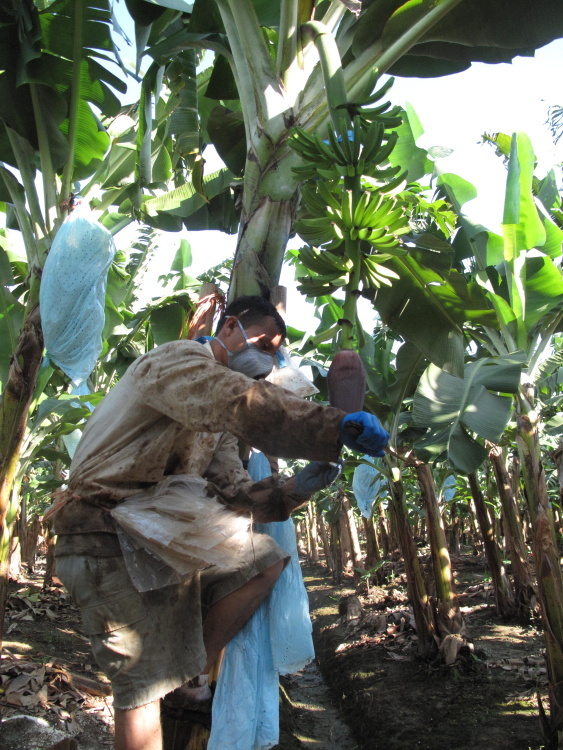 They are to keep the fungicides in…not to keep bats and birds out like I thought. Apparently, the bugs and bird prefer the ripened sweet bananas and not so much the green ones. Once ready, the bunches are chopped down and put on these cool ziplines. And zipped to the packing area. 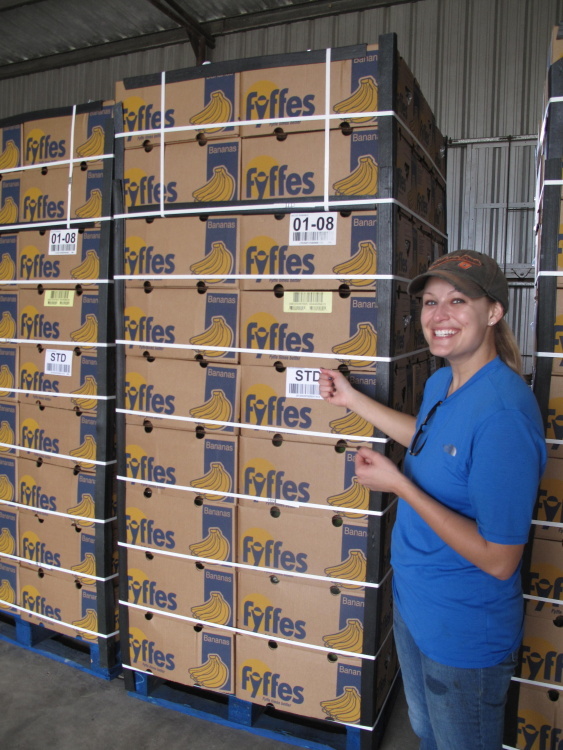 The bananas are cushioned and treated like gold. HOW ARE THEY SO CHEAP IN THE STATES? Well…in many stores, bananas are considered “loss leaders”. 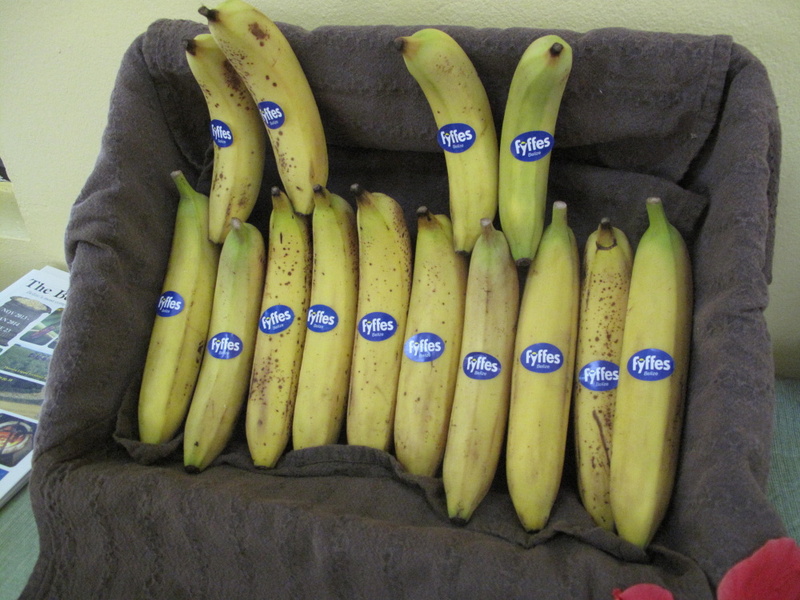 Since almost everyone has bananas on their shopping list, big retailers sell bananas at a LOSS to bring in customers that will spend money on other things. Cool, right? And an idea that I might suggest to some of the big resorts on Ambergris Caye. Charging $6US for a beer (that costs about $3bzd) is not a way to get people to spend money at your restaurant. But that’s for another time. Holy moly. 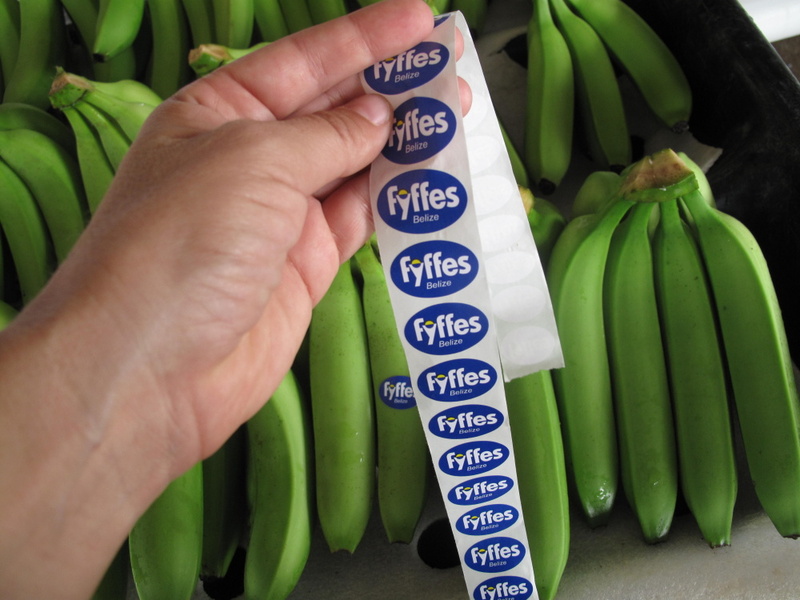 I will never ever ever again complain about paying 25 cents Belize for a banana. I will never throw out half of a banana. 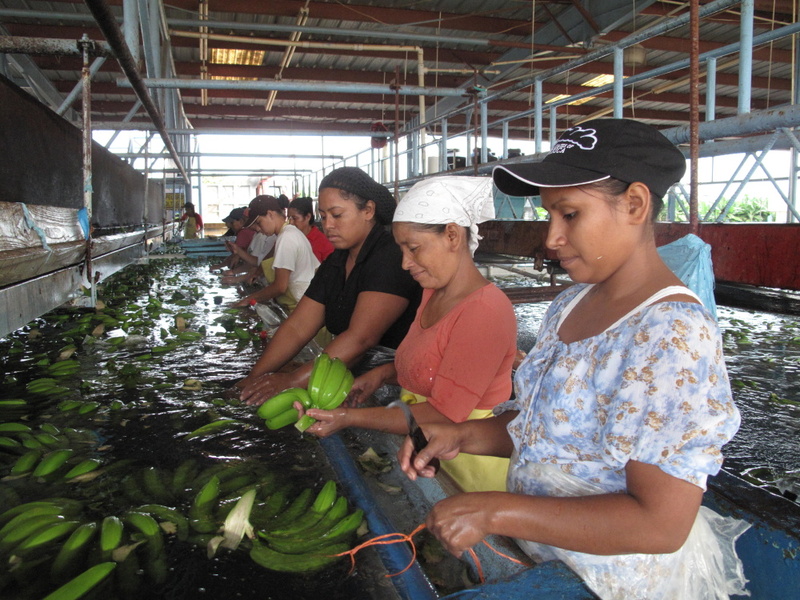 The amount of work that goes into tending these plants and getting the fruit ready for market? Ridiculous! 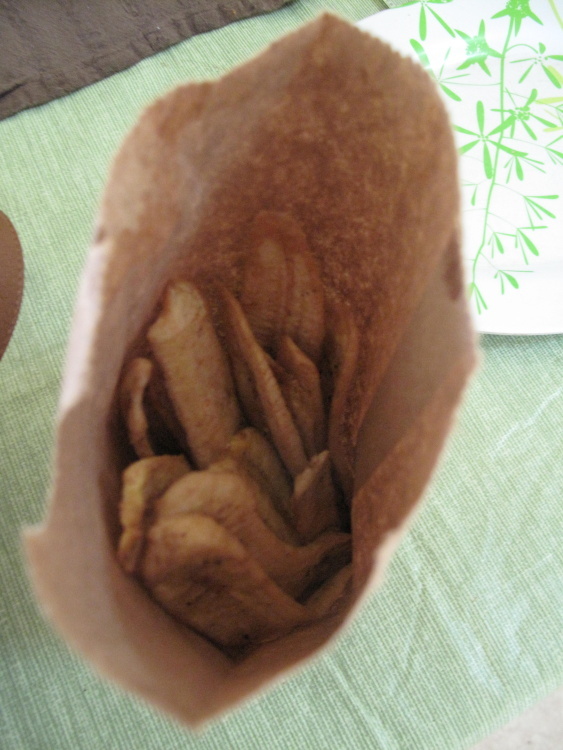 I needed the fresh warm green banana chips I was given before Evin drove me back to my hotel. Yum. Even though it has rained the night before HARD, I did not get any mud on me. There were no bugs that I encountered (and Evin has bug spray AND sun screen – Banana Boat! – for you if you need it). It’s not hot…you are under the shade of the plants or in an Air Conditioned room. This tour is SUPER FUN and you can be back to Placencia or Hopkins by lunch-time. 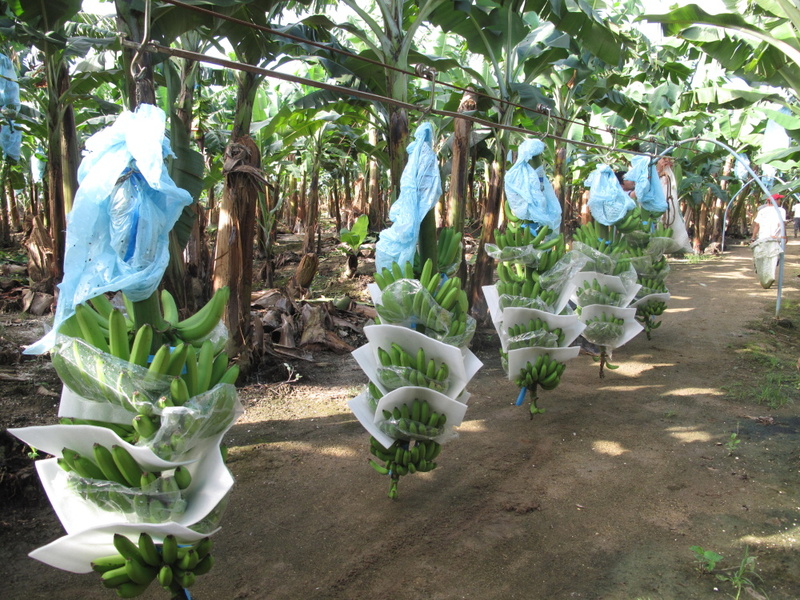 If you are in any way interested in learning new things, finding out how every day items are produced or just seeing something different, you will definitely go bananas. For information, check them out on Facebook – Bunches of Fun Tours. Right now they are running tours on Monday, Wednesday, Fridays and Saturday. The price is $15US for adults and $10US for kids. A pick-up from town is $20US (round trip) and free if you can gather a bunch of 6 or more. Plus, look at these cool free stickers I got. 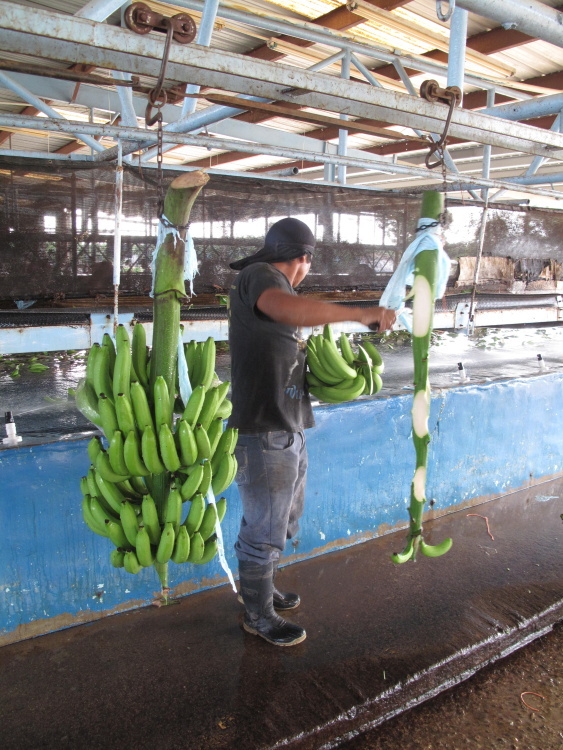 And feel free to ask me question in the comments, I have read even more about bananas in Central America since I got back. This stuff is REALLY interesting. Oh yes…and one more thing! 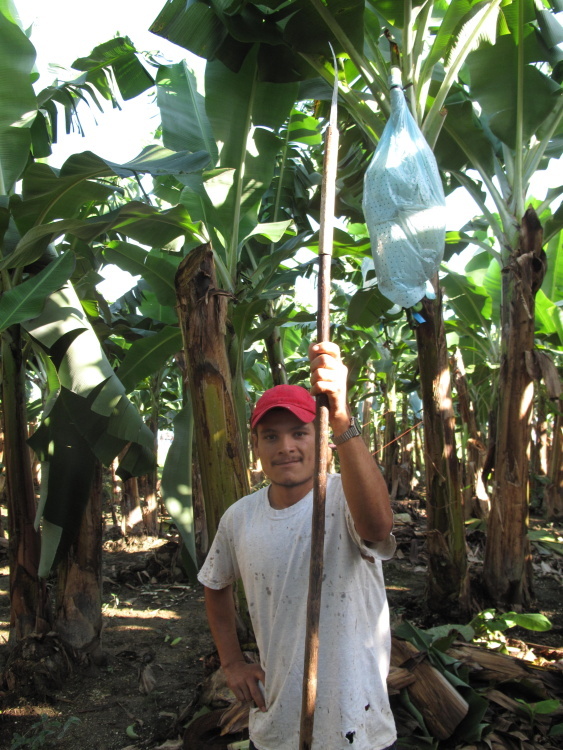 Thanks so much to Sagitun Farms for donating 20lbs on banana to last month’s Placencia Half Marathon and Marathon. 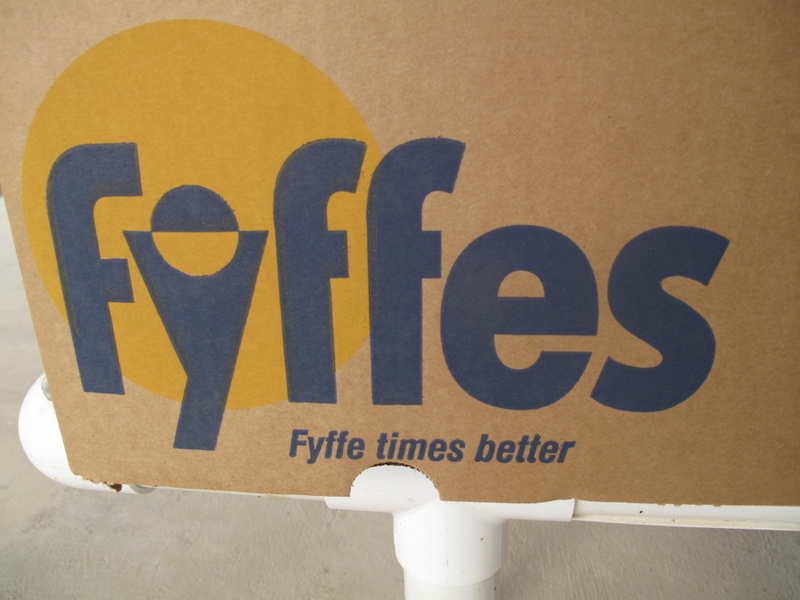 The perfect exercising food. Super blog post! And, yes, ask Erin to write that romance novel about her life. I want to write it! that, sir….was a great read..!! Fascinating! Do they just grow the one size of banana there? I was very partial to the smaller bananas (“apple bananas” or “pineapple bananas”) that some of the fruit stands sold in San Pedro. 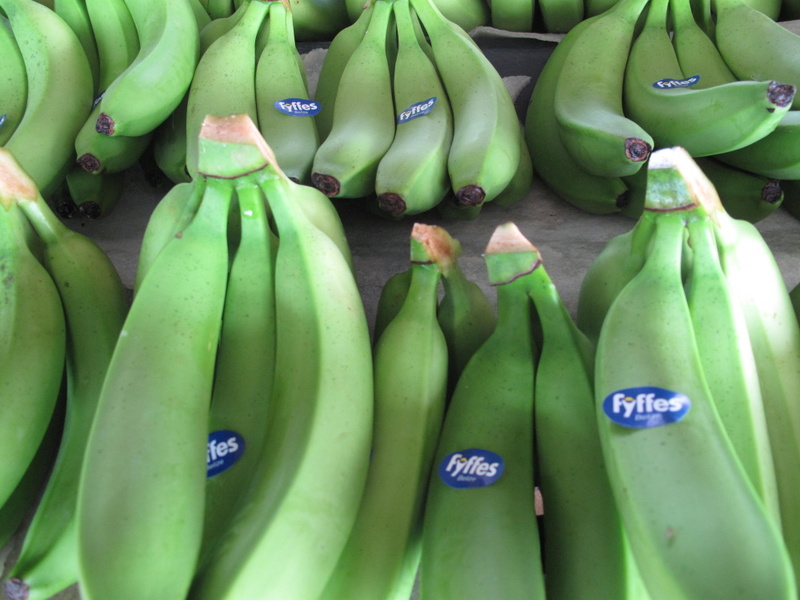 They stayed fresh without getting over-ripe for longer since they cut them right off the bunch when we bought ’em and to me have more flavor, slightly more tart, and remain firmer than the standard bananas like we get in the US. 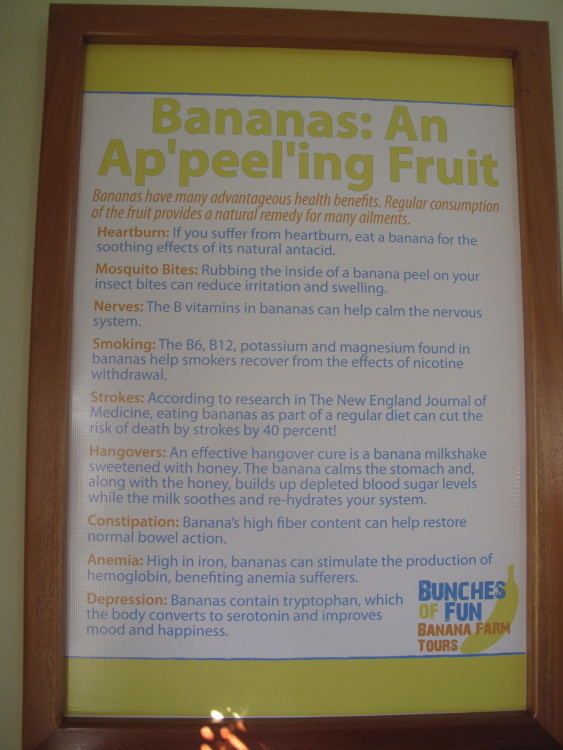 Now that I’m back in the States, I miss those “baby bananas” a lot.